G7 Leaders pose for a picture on May 26, 2017 in Taormina, Italy. Courtesy of G7 – Twitter. 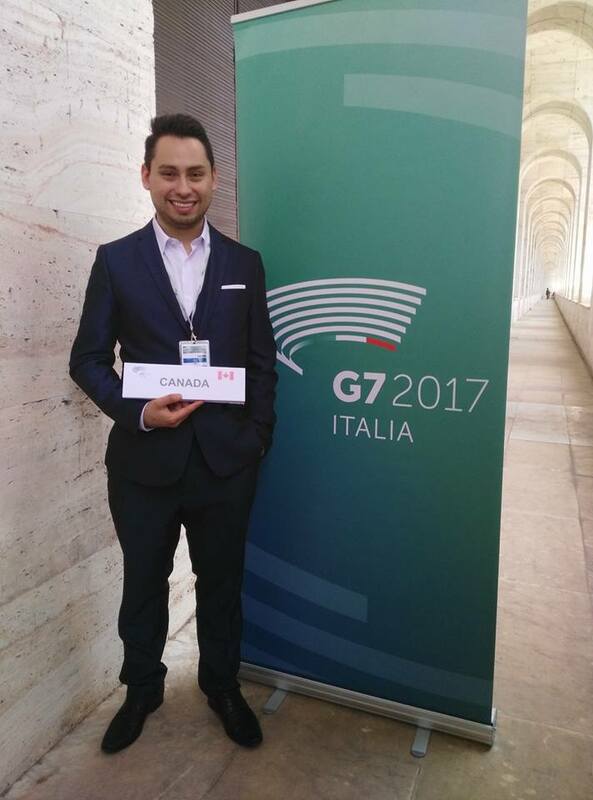 From May 7 to 9, 2017, Miguel A Rozo, a Vancouver-based social entrepreneur, advocate and UBC International Relations graduate, represented Canada at the G7 Youth Summit in Italy as a Young Diplomats of Canada delegate. Today he is sharing with us the first of his “Global Affairs series” reflection pieces on the role of youth in global affairs and the Fourth Production Revolution. Leaders from the G7 met this weekend to discuss and find agreement on themes ranging from free trade, climate change, and security among others. The world paid close attention to Taormina, Italy, as leaders set the tone for collaboration on common challenges that require transnational commitment. The G7 is a forum comprised by some of the most industrialized economies in the world, including Canada, France, the United States, Great Britain, Germany, Japan and Italy. The European Union (EU) attends the G7 but does not chair or host Summits. This was the first G7 Summit for US President Donald Trump, French President Emmanuel Macron, British Prime Minister Theresa May and the host of the summit, Italian Prime Minister Paolo Gentiloni. Member countries rotate the Presidency each year and Canada will host the G7 in 2018. 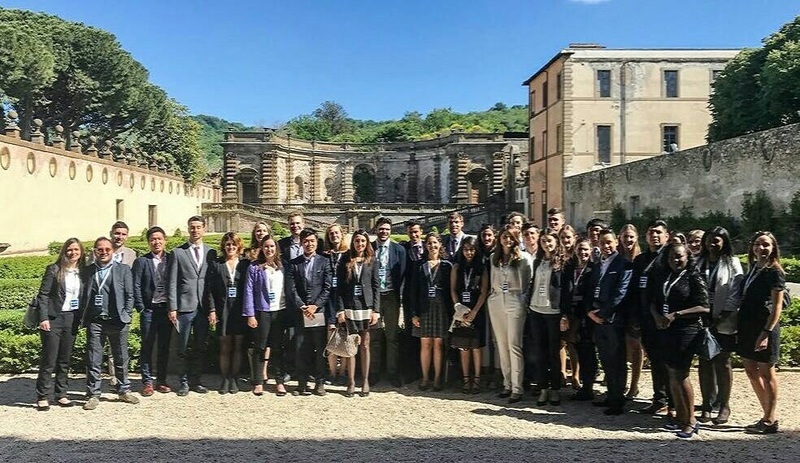 While conversations ultimately proved to be “very difficult” as noted by German Chancellor Angela Merkel, particularly due to a lack of commitment from US President Donald Trump to uphold the Paris climate change accord, young people rose to find common ground and find solutions at the G7 Youth Summit (Y7) in Rome, Italy from May 7-9. G7 Youth Summit Delegates on the first day of the Summit at Villa Mondragone in Rome, Italy. May 7, 2017. Delegates from the G7 countries (and the EU) were invited to represent the youth of their jurisdictions and negotiate a Communique that is generally shared with the G7 Leaders. I had the honour represent Canada at the G7 Youth Summit in Rome, Italy from May 7 to 9. Thanks to the Young Diplomats of Canada, myself and three other Canadians attended the Summit and negotiated on behalf of Canada’s Youth with other G7 counterparts before delivering our Communique to the G7 Presidency on May 9. The process leading up to be a delegate, pre-summit negotiations, the Summit itself, and discussions on the implementation of the Communique on a Canadian context, has already proven to be an exceptional experience. What is the purpose of the G7 Youth Summit? The motivation behind the Summit is to provide actionable and specific recommendations for the G7 leaders while reflecting on the perspective of future leaders and youth. This year, the Italian G7 Presidency laid out three main pillars of focus; (1) Citizen Safety, (2) Economic, Environmental and Social Sustainability, and (3) the Reduction of Inequalities, and Innovation, Skills and Labour in the Age of the Fourth Production Revolution. Youth delegates focused on the third pillar given the theme for the Y7: “Rethinking innovation as a catalyst for inclusive, open, and sustainable growth.” We ultimately delivered a set of recommendations structured in three subsections. For the full communique please follow this link. Production Innovation – we supported the continuation of a data economy while ensuring the protection and empowerment of individuals, achieving sustainable growth in accordance with Paris agreement, and facilitating dynamic start-up ecosystems and reducing barriers to innovation. Knowledge-Based Capital and Enabling Infrastructure – we stressed the desire for governments to promote STEM literacy, enhance personalized education systems and lifelong adaptability, build public and private partnerships in education (including acknowledgement of indigenous rights) and promote vocational and continuous training. The Future of Work and of Welfare Systems – we stressed the need to tackle inequalities, ensuring that all youth have equal access to employment, to adjust welfare systems in order to ease the transitioning into an automated and digital economy, and innovating tax schemes, recognizing the changing nature of work and increased strain on social programs as a result of an ageing population. I was the Canadian representative on the “Future of Work and Welfare Systems” working group. Ultimately all delegates voted on the final Communique, but a large portion of our time was spent within our respective working groups. As a so-called “millennial” myself, I can relate to the difficulties that people (especially youth) have to overcome in order to obtain stable employment. The increasing reliance on contract, part time work, and virtual marketplaces as a source of income will require the need to adjust welfare systems. It is important for governments to implement long-term outlook policies to cope with economic downturns, short term work, and increasing job insecurity while creating the conditions for new market trends that foster sustainability and innovation. Left Image: The Canadian G7 Youth Summit Delegation (Left to Right) Waabishkigaabo (Will Landon), Sebastian Deviault, Heather Evans and Miguel A Rozo. Right Image: Delegates meet Canadian Ambassador to Italy, Peter McGovern. I will be sharing more details on the Summit’s Communique and how this could be implemented on a Canadian context in my next “Global Affairs series” editorial. Ultimately the G7 Youth Communique calls on leaders to innovate policy in order to adjust to the Fourth Production Revolution. This is a revolution that (has already begun) and is characterized by a rise in automation, displacement of workers, rise in the digital economy/virtual marketplaces, change in educational models, and new market trends that have yet to be seen. While challenges lay ahead, our communique proposes innovative and forward-thinking policies to transition effectively. From adjusting social benefit programs to dealing with the increasingly flexible and short term nature of work, to innovating taxation policies, promoting STEM literacy, and encouraging dynamic start up ecosystems that have a sustainability angle among others – all of these were the result of negotiations by young leaders who believe we can springboard to the next Production Revolution while ensuring no one is left behind. These types of discussions will become increasingly common, especially now as we face global issues such as climate change. What we don’t often times hear are the solutions. Many of which are within reach, and the G7 Youth Summit delegates have proven that. All we need is the political will, bold and forward-thinking leaders, and a commitment to work together.